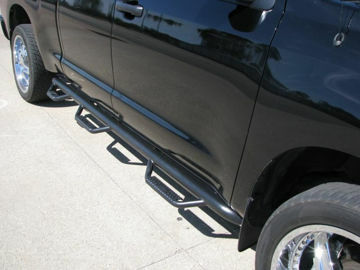 N-FAB is the industry leader in quality Nerf-Bars, Pre-Runners and other Off-Road accessories. We design and manufacture the best looking, strongest, and most durable Nerf-Bars available in the industry today. At N-FAB, we are committed to building a heavy duty, high-end, high-quality tubular parts for all the latest trucks and SUV's, even dating back to the 80's. While others are using thinner tube to cut cost, N-Fab still use heavier gauge .084-wall steel, with an welded one-piece construction. We Zinc coat each part for better protection from rust. Lastly, we finish our parts in a thick layer of high gloss powder-coating for a long lasting finish coat. These standards N-Fab lives and breathes far surpass any of our competition. If you want products that are unique and designed to last longer, look cleaner, function better, then N-FAB has what you are looking for!